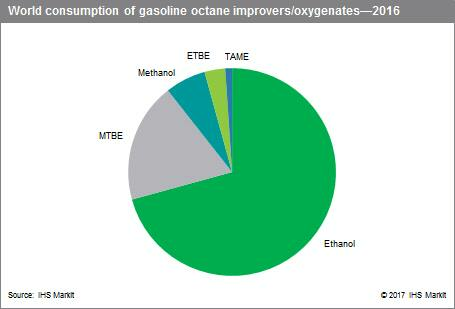 Gasoline octane improvers/oxygenates include three major compounds–ethanol, methyl tertiary5butyl ether (MTBE), and ethyl tertiary-butyl ether (ETBE). The major exception is in China where methanol is the leading compound consumed, largely because of China’s vast coal-to-methanol capability. tertiary-Amyl methyl ether (TAME) and tertiary-amyl ethyl ether (TAEE)are also consumed in several regions. Reformulated gasoline (RFG) is gasoline blended to burn more cleanly than conventional gasoline and to reduce some smog-forming and toxic pollutants in the air. The RFG program was mandated by the US Congress in the 1990 Clean Air Act amendment. The first phase began in 1995 and the second (current) phase began in 2000. RFG is required in cities with high smog levels and is optional elsewhere. RFG is currently used in 17 states and the District of Columbia. About one-third of the gasoline sold in the United States was reformulated in 2016, and contains octane improvers/oxygenates. The largest-volume gasoline octane improver/oxygenate used in the world is ethanol. In recent years, ethanol use has grown significantly in the United States and Brazil, and to a lesser extent in other countries. Ethanol is the only octane improver/oxygenate consumed in all countries/regions of the world (except Mexico). Global capacity and consumption growth of biofuel ethanol has been largely the result of government mandates. Growth forecasts are currently at less than 3% per year, but consumption could potentially double should all countries that have mandated fuel ethanol levels standards actually met their targets. One of the main obstacles to reaching this target is that many of the developed countries are projected to have a reduced gasoline consumption in 2021 because of improved motor vehicle gas mileage, the introduction of electric (EV) and hybrid-electric (HEV) vehicles, and other new technologies. Most regions of the world will have blend rates between 5-10% in 2021, but could be as high as 15-20%. In the major fuel ethanol consuming regions, the industry has experienced turbulence during recent years as a result of higher feedstock prices, overcapacity, falling ethanol prices, and political uncertainty, with renewed concerns and pressure surrounding the utilization of land and crops for fuel purposes as opposed to food supplies. The decline in crude oil prices to below $50 per barrel since late 2014 has created even more uncertainty on the future of social and political sentiment toward biofuels. The next leading gasoline octane improver/oxygenate is MTBE. Starting in the late 1970s, MTBE was the predominant choice of gasoline oxygenate used worldwide because of its low cost, high octane value, and easy incorporation into gasoline stock. However, in the late 1990s, MTBE was alleged to cause detrimental environmental impact by contaminating water supplies. As a result, use in Japan ceased consumption in 2001, and in the United States and Canada in 2006. MTBE is still widely used as an octane booster in motor gasoline in Europe, the Middle East, Africa, and Asia. The United States still produces MTBE but nearly all is exported. There are several large Latin American consumers of MTBE; the largest are Mexico and Venezuela, which import considerable quantities of MTBE from the United States. Both have made some plans to use more ethanol or ETBE to reduce GHGs, but general inertia and fear of higher corn prices have limited the switch. Much of the MTBE consumption growth will be in China, although Chinese consumption growth will slow from historical rates. In 2016, Northeast Asia accounted for nearly half of total world MTBE consumption, of which China accounted for nearly 86%. The third-largest-volume gasoline octane improver/oxygenate used in the world is methanol. Consumption is primarily in China, with smaller quantities being consumed in Western Europe, the Middle East, and Africa. In addition, methanol is consumed in the production of MTBE and TAME. New Chinese plants are being built to produce methanol from coal, which is in ample supply in the country. Chinese fuel blenders have been motivated to use more methanol, as its price remains attractive relative to gasoline and diesel prices. The new methanol fuel standards introduced in China are expected to boost methanol use in fuels, but methanol is not forecast to replace gasoline to any major extent. Some provinces already allowed up to 15% methanol blended with gasoline, and it appears that blending may approach 20% in the more remote areas. Direct gasoline blending of methanol is expected to continue in China. ETBE is consumed primarily in Western Europe and Japan, where the mandated use of biofuels is driving consumption for bioethanol-based ETBE. As of 2017, Japan increased blending rates for ETBE from 7% to 22% by volume, which is expected to drive future consumption. The shift to ETBE has been in response to the commitment under the Kyoto Protocol to cut greenhouse gases.